To save on any wastage or surplus and upcycle the same, the team at Shamwari, headed up by Peta-Lynn, now delivers any unused soap, toilet rolls and guest slippers to various children’s homes and organisations in the area. 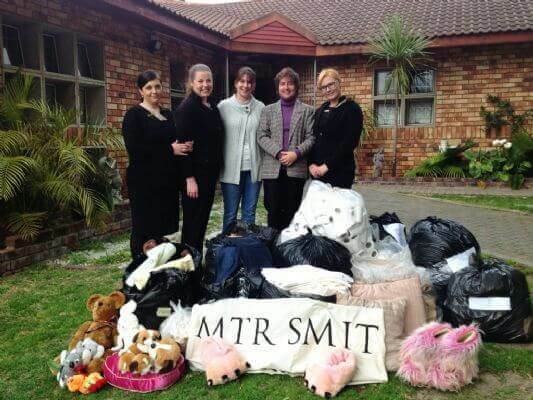 Adding to this, staff have become involved first hand and collect any clothes from home they wish to donate and all gets delivered on a regular basis by Peta-Lynn and her team of therapists to several organisations. This helps tremendously as many of the children’s’ homes and organisations receive minimal funding and have to rely on the generosity of donations in order to keep their doors open. One of them is the Eastern Province Child & Youth Care Centre, who wrote this beautiful thank you letter. On behalf of the children and staff of the Eastern Province Child & Youth Care Centre, I would like to take this opportunity to thank you for the donation of linen. It is greatly appreciated. We receive only 40% of our funding from the state, and have to rely on donations for the balance of our expenses. These donations are needed to make it possible for us to provide for the needs of our children and change their lives for the better. Our Basic needs include: shoes (takkies), toiletries, stationery, under wear, pyjamas, casual clothing for the children. For the cottages we require cleaning materials and other household goods. Your contribution makes it possible for us to provide for the needs of our children and change their lives for the better. Once again thank you for your generous donation.